A comprehensive solution to prepare for and respond to emerging crises at the speed of the digital age. Better prepare your people by moving plans and communications to their smartphone. 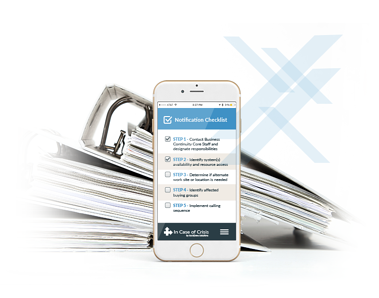 Transform lengthy documents into digital playbooks that enable participation and promote compliance. Activate your people and support collaboration throughout a crisis. Integrates quickly and securely with your enterprise. "I didn’t want to rely on paper emergency plans because our warehouses can be up to 1 million square feet, or our managers might be outside after an evacuation, or an emergency could hit while managers were at home during off-hours. We needed better access to our emergency plans."